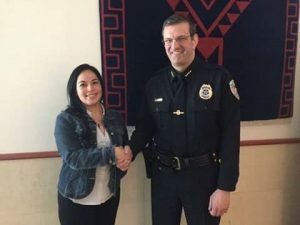 During June, JPD Chief Bryce Johnson met with Christina Wigg and presented her with a JPD challenge coin, an award JPD gives to officers and civilians to mark a significant accomplishment. Wigg has certainly earned that award, on the day of our interview on June 10, 2016, Wigg marked her tenth anniversary of being free of narcotics. In addition to staying off cocaine, Wigg has done better than most people who went to prison. She has a professional job, is continuing her education, supports others coming out of prison, and has a healthy relationship with her son. Wigg had a rough path getting to this point. When she was 19 she was already experienced with running with an older crowd and drinking. She was enrolled in college and it looked like she would put all that behind her. Then her father disappeared from her life for his own reasons. She tried to be the steady person in the family but wasn’t ready for the responsibility of paying bills, having her own place, and working two jobs. Wigg found relief in cocaine, then an income in trafficking cocaine, with help from a boyfriend who had her doing all the drug deals and transporting drugs within Juneau. Eventually, law enforcement caught up to Wigg. She was out on bail and offered drug treatment but continued to make bad decisions. By June 9, 2006, Wigg was headed for prison. Wigg says the turning point for her was a one year drug treatment program at Hiland Mountain Correctional Center in Eagle River. In that program she was confronted with her criminal thinking. She went into that program blaming her situation on the confidential informant who worked with JPD and bought drugs from her. Wigg says she had to accept that her situation, being in prison, was a result of her behavior, and no one but her was to blame. Christina Wigg successfully completed probation recently. She works in the medical field, is raising her son, and is in a long-term, and healthy, relationship. She is taking classes to learn to effectively help others who have faced some of the same challenges she has overcome. It was an emotional moment for everyone there when Wigg distinctly moved away from a history of being arrested by, even chased through the snow by, JPD officers to receiving an award from JPD’s Chief of Police. It was obvious from Wigg’s reaction just how long and difficult that journey had been. JPD would like everyone to know how proud we are of Christina Wigg and we look forward to working as a partner with her as we all support others who are trying to live a healthy, productive life after incarceration.